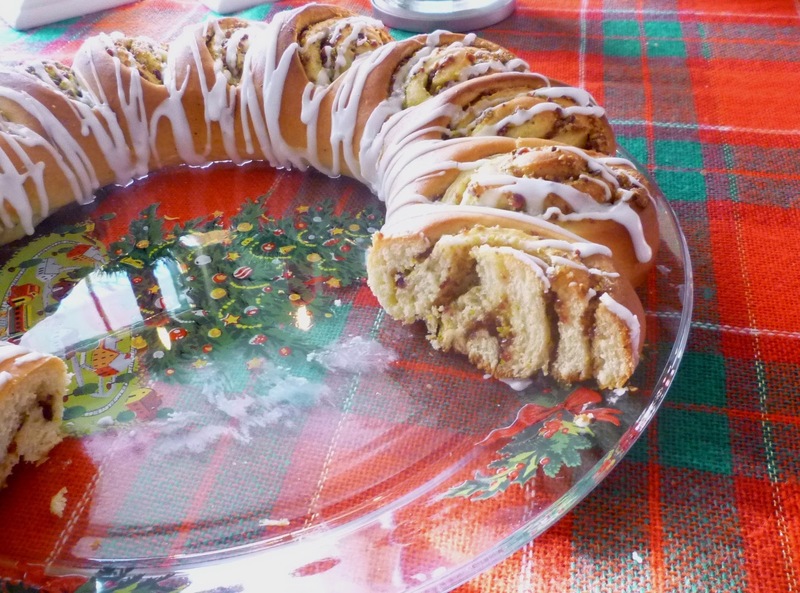 Christmas breakfast at my house has always been just coffeecake. No eggs or meat…or cereal…just coffeecake, coffee and juice. It has only been in recent years that I have added fruit and yogurt to the spread. 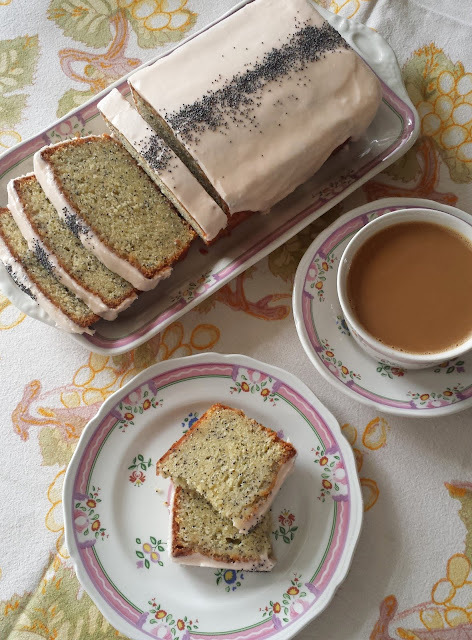 Up until my teen years, my mother experimented with different coffeecakes each year. Around the time I turned 12 or 13 she discovered a cherry filled coffeecake that eventually became “the” Christmas coffeecake in our house. And for many years into my adulthood, it was the coffeecake I was asked to make whenever preparing the family Christmas breakfast fell to me. I posted my eventual adapted version of this cake a few years ago. It is a delicious cake, but several years ago I began longing for a change. The Christmas bread I am posting today is the recipe that has displaced our family’s traditional cake…at least as far as my house is concerned. The dough for my coffeecake is nothing more than a basic white sweet roll dough…the kind you would use to make soft dinner rolls, cinnamon rolls, sticky buns, or a braided coffeecake. My recipe came from my grandmother…but if you have a favorite recipe, you should of course use that one instead. 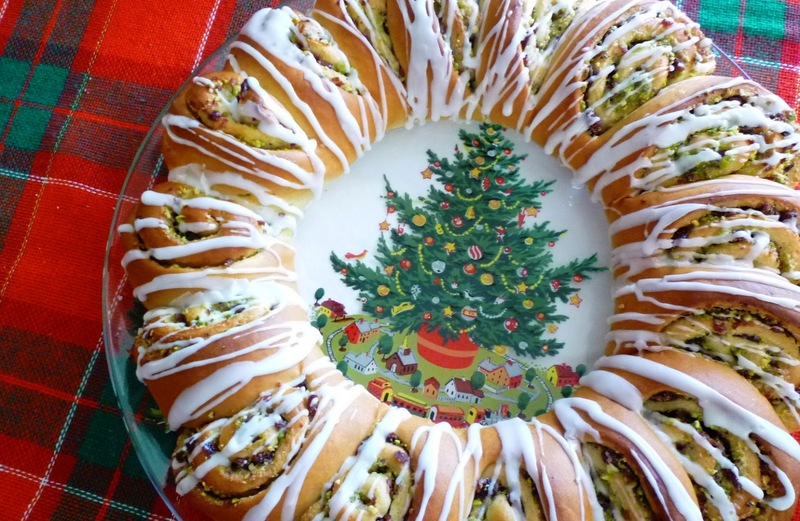 I have enhanced the dough with some of my favorite holiday flavors—cardamom and orange—and have filled it with pistachios and dried cranberries to complete the holiday theme. The shape of the cake is traditional. Marion Cunningham (in the Fannie Farmer Baking Book) calls it a Blooming Coffeecake Ring. 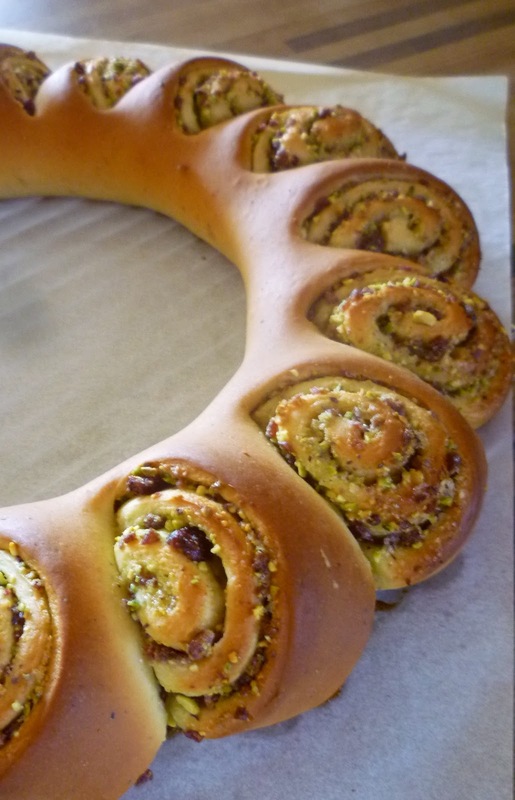 My friend Bonnie—a Scandinavian baker extraordinaire—calls it a Swedish Tea Ring. 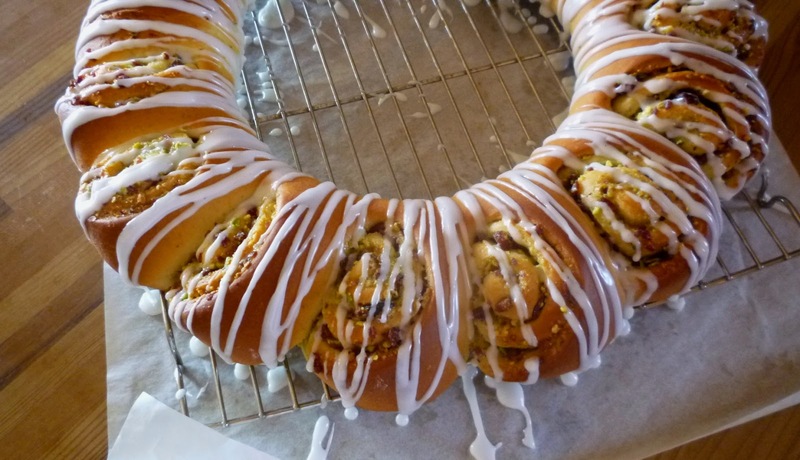 One of the reasons I like serving it for my Christmas breakfast is that the finished cake resembles a wreath. One of the best things about this coffeecake is that it is actually better if you make the dough the day before you want to serve it. It is possible to make the dough, let it rise, and then immediately form, proof and bake the finished loaf…but the flavor isn’t as good, and the soft room temperature dough is more difficult to roll, fill and form into a wreath than dough that is firm from an overnight chill in the refrigerator. So if you can squeeze in a few moments to make the dough during the afternoon or evening on Christmas Eve, on Christmas morning you will only have to form the loaf, let it rise and then bake while you do other things. but this will give you a large surface area on which to spread the filling. This will in turn give a thinner layer of filling that will have less of a tendency to fall out of the coiled dough. To further help the filling adhere, run the rolling pin over the filling once, using very light pressure (you don’t want to press so hard that the larger bits of pistachio and cranberry pierce through the dough). When you roll up the coiled log of dough, the roll should be snug…but not so tight that the dough stretches as you roll it up. When you are making the cuts into the ring of dough, make the cuts deeper than you think is a good idea. Obviously you don’t want to cut through the log of dough, but you want to be able to twist the individual slices without deforming them. As you turn the slices to expose the cut surfaces, you will need to pull out and away from the center of the ring at the same time. This will allow you to expose as much of the cut surfaces as possible with only a small amount of overlap. If you look carefully at the pictures of the process, you will notice that the diameter of the hole in the center of the ring expands substantially during the forming process. As you form the wreath, you will probably have to make more than one pass around the ring…nudging, tucking, turning, pulling…gently manipulating the coils of dough to make them do what you want them to do. If it looks a bit messy the first time you try, don’t worry…it will look better after proofing and baking. And every time you make it, it will look even better. I have been so pleased with my wreath coffeecake. I look forward to it every year. It has been my intention to post the recipe each Christmas since I began keeping my blog. But the holiday always seems to fly past before I can squeeze it in. So this year, I have just decided to go ahead and share it even though the day itself has passed. We are still in the midst of the holiday season…and there are still hungry guests to be fed. And even if you aren’t in the mood for just one more holiday baked good this year…there will always be next year. Soften the yeast in the warm water. While the yeast is proofing, scald the milk. Remove the milk from the heat and add the butter. When the butter is melted, add the sugar and salt. At this point, the mixture should have cooled sufficiently, but if you are unsure, simply check it with an instant read thermometer to make sure the mixture is under 115°F. Add this warm milk/sugar mixture to the softened yeast and whisk to combine. Whisk in the egg, zest and cardamom. Add 1 c. of the flour and whisk until smooth. Gradually stir in enough of the remaining flour (about 1 1/2 cups) to form a soft dough. and knead until smooth and elastic (5 to 10 minutes), using only enough of the remaining half cup of flour to keep the dough from sticking. Place the dough in a buttered bowl. Turn the dough to coat with butter and cover the bowl with plastic wrap. Let the dough rise until doubled in bulk (about 1 1/2 hours). While the dough rises, prepare the filling: Place the sugar and pistachios in the food processor. Process until the nuts are finely ground. Add the cranberries and pulse until chopped medium fine. Set aside (cover with plastic if storing overnight or for several hours). When the dough is fully risen, gently deflate, cover and place in the refrigerator overnight. (Alternatively, you may proceed with rolling, forming, proofing and baking the dough immediately, but the bread tastes better...and the dough is easier to manipulate...after a long, cool, second rise in the refrigerator). In the morning, deflate the dough again. Form the dough into a flat rectangle. Dust your work surface lightly with flour. Roll the dough out to a large thin rectangle (about 10- by 20-inches), making sure that the long side runs parallel to the edge of the work surface in front of you. Brush the dough with 3 T. of melted butter, leaving a 1/2-inch strip across the top bare. Scatter the filling evenly over the buttered dough, leaving the aforementioned 1/2-inch strip bare. I like to take my rolling pin and run it—with very light pressure—over the filling to help it adhere. Starting with the edge nearest you, roll the dough up snugly, jellyroll-style (as for cinnamon rolls). Pinch the long seam to seal. Turn the roll so that the seam is on the bottom. Form the roll into a ring by bringing the ends together and pinching to seal. Place the ring on a parchment lined baking sheet. With a large sharp knife or a bench scraper, make sixteen to twenty very deep cuts all around the outside of the ring. Turn each slice a quarter turn to expose the cross-section of the ring, pulling out and away from the center slightly as you do and thus expanding the diameter of the ring. The cross-sections should overlap one another just slightly. Cover with plastic wrap and let rise in a warm place until doubled in bulk (about 45 minutes to an hour). The proofed wreath will look puffy and slightly swollen and when gently pressed with a floured fingertip, the indentation will remain. Bake the wreath at 375° until puffed and golden brown—about 18 to 20 minutes (the internal temperature will be somewhere between 180° and 190°). Remove from the oven and slide onto a wire rack (you may need to gently slide a thin spatula underneath the wreath to help release it from the parchment). Let cool for a few minutes. Drizzle with the powdered sugar icing—using a spoon or a parchment paper piping bag. Serves 8 to 16 (depending on appetites and other things being served). I made this pastry yesterday (Christmas Eve, 2016) as a Christmas present for my husband. It turned out wonderfully. Your instructions are complete and easy to follow. It is delicious! 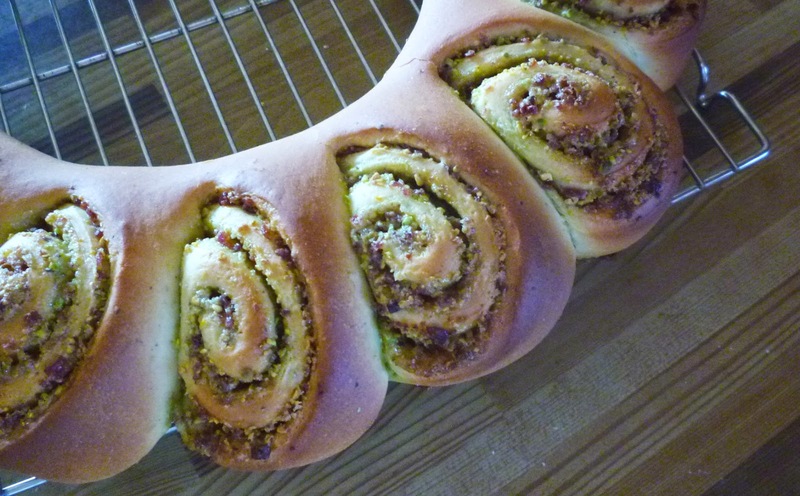 I've been looking for a Christmas bread recipe for a long time and this is an excellent one. I would give it 5 stars. Thank you!! I'm so pleased to hear you tried this and liked it. We were just finishing our Christmas breakfast (of the same) when I saw your comment (I posted a picture of mine to Instagram). Thank you for taking the time to let me know. Merry Christmas!